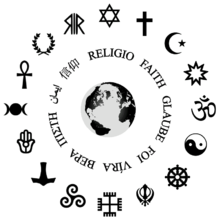 Religious symbols in clock-wise order: Judaism, Christianity, Islam, Bahá’í Faith, Hinduism, Taoism, Buddhism, Sikhism, Slavic neopaganism, Celtic polytheism, Heathenism (Germanic paganism), Semitic neopaganism, Wicca, Kemetism (Egyptian paganism), Hellenism (Greek paganism), Italo-Roman neopaganism. Religion is a collection of cultural systems, beliefs and world views that establishes symbols that relate humanity to spirituality and, sometimes to moral values. While religion is hard to define, one standard model of religion, used in religious studies courses, was proposed by Clifford Geertz, who simply called it a “cultural system.” A critique of Geertz’s model by Talal Asad categorized religion as “an anthropological category.” Many religions have narratives, symbols, traditions and sacred histories that are intended to give meaning to life or to explain the origin of life or the universe. They tend to derive morality, ethics, religious laws, or a preferred lifestyle from their ideas about the cosmos and human nature. According to some estimates, there are roughly 4,200 religions in the world. The word religion is sometimes used interchangeably with “faith” or “belief system”, but religion differs from private belief in that it has a public aspect. Most religions have organized behaviours, including clerical hierarchies, a definition of what constitutes adherence or membership, congregations of laity, regular meetings or services for the purposes of veneration of a deity or for prayer, holy places (either natural or architectural) or religious texts. Certain religions also have a sacred language often used in liturgical services. The practice of a religion may also include sermons, commemoration of the activities of a god or gods, sacrifices, festivals, feasts, trance, initiations, funerals, marriages, meditation, music, art, dance, public service or other aspects of human culture. Religious beliefs have also been used to explain parapsychological phenomena such as out-of-body experiences, near-death experiences and reincarnation, along with many other paranormal experiences. Some academics studying the subject have divided religions into three broad categories: world religions, a term which refers to transcultural, international faiths; indigenous religions, which refers to smaller, culture-specific or nation-specific religious groups; and new religious movements, which refers to recently developed faiths. One modern academic theory of religion, social constructionism, says that religion is a modern concept that suggests all spiritual practice and worship follows a model similar to the Abrahamic religions as an orientation system that helps to interpret reality and define human beings, and thus religion, as a concept, has been applied inappropriately to non-Western cultures that are not based upon such systems, or in which these systems are a substantially simpler construct. A group of monotheistic traditions sometimes grouped with one another for comparative purposes, because all refer to a patriarch named Abraham. Eastern Catholic Churches : In full communion with and subject to the Catholic Communion and Roman Church, but retaining a diverse array of Eastern Christian liturgical rites; including the Maronites and Byzantine Catholics. Oriental Orthodox Churches (called Non-Chalcedonian or miaphysite/”monophysite“): Includes the Armenian Apostolic, Coptic, Syrian Orthodox, Ethiopian and Eritrean Orthodox Churches, as well as a portion of the St. Thomas Christians in India. Orthodox Catholic Church (called “Eastern Orthodoxy” or Orthodoxy): Includes the Greek Orthodox, Serbian Orthodox, Russian Orthodox, Romanian Orthodox, Bulgarian Orthodox, Georgian Orthodox, and several other autocephalous and autonomous Churches. Many Gnostic groups were closely related to early Christianity, for example, Valentinism. Irenaeus wrote polemics against them from the standpoint of the then-unified Catholic Church. None of these religions are still extant. Samaritans use a slightly different version of the Pentateuch as their Torah, worshiping at Mount Gerizim instead of Jerusalem, and are possibly the descendants of the lost Northern Kingdom. They are definitely of ancient Israelite origin, but their status as Jews is disputed. Noahidism is a monotheistic ideology based on the Seven Laws of Noah, and on their traditional interpretations within Rabbinic Judaism. According to Jewish law, non-Jews are not obligated to convert to Judaism, but they are required to observe the Seven Laws of Noah. Indian religions are the religions that originated in the Indian subcontinent; namely Hinduism, Jainism, Buddhism and Sikhism, and religions and traditions related to, and descended from them. Traditionally, these faiths have all been classified “Pagan”, but scholars prefer the terms “indigenous/primal/folk/ethnic religions”. Most historical religions were polytheistic, but some, such as Atenism, were much closer to monotheism. Jump up^ “World Religions Religion Statistics Geography Church Statistics”. Retrieved 5 March 2015. Jump up^ “Key Facts about Near-Death Experiences”. Retrieved 5 March 2015. Jump up^ Harvey, Graham (2000). Indigenous Religions: A Companion. (Ed: Graham Harvey). London and New York: Cassell. Page 06. Jump up^ “Irenaeus of Lyons”. Retrieved 5 March 2015. Jump up^ “Samaritans”. Retrieved 5 March 2015. ^ Jump up to:a b “Welcome to Jainworld – Jain Sects – tirthankaras, jina, sadhus, sadhvis, 24 tirthankaras, digambara sect, svetambar sect, Shraman Dharma, Nirgranth Dharma”. Jainworld.com. Retrieved 2012-04-24.